For a change, we parked at Marquis Drive and set out from there. The green route was actually a lot of fun, with quite varied scenery and some really beautiful parts – less ragged by timber felling and the like. It was ridiculously windy in parts though – at the top of one hill, I could feel myself being blown sideways. Mr Toast has installed the lockout lever for the Rebas on my bike, and I really felt the benefit going up the hills. My knees felt quite battered on some parts though, REALLY need to get them sorted. At the start of 14 I managed to misplace Mr Toast (he didn’t realise I’d headed up to Ill Phil’s Hill). Still, I was quite proud, as I managed, for the first time ever, to climb up the hill leading to section 14. I think the fact it had rained the previous day helped quite a bit. Once I rejoined Mr Toast, we did the fireroad hill, the short downhill bermy bit (not sure if it’s still classed as section 8), then a couple of the woodland sections. Not bad for a day’s work. I was actually really pleased with my riding around FTD, felt really flowing and consistent. I was also pleased with doing the green loop too – I don’t think I would have had the fitness to do it last year, never mind follow it with some red route action! Bad bits: My crap knees, causing me to munch a lot of ibuprofen. ‘Twas my birthday yesterday, and Mr. Toast gave me the most excellent gift of an upgraded bike! My V-brakes were replaced with hydraulic discs – Avid Juicy 3s, my Dart 2 forks replaced with Rebas, my pedals replaced with V8s, and my narrow Bontrager handlebars replaced with slightly wider Specialized handlebars. 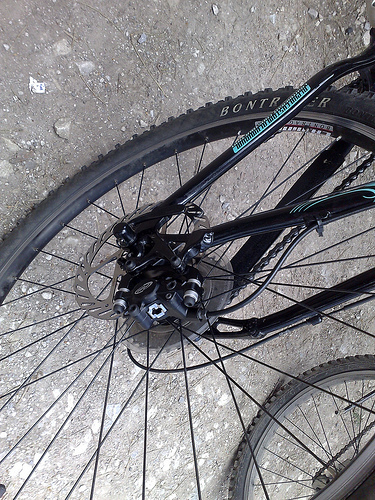 The new brakes were fantastic – it’s amazing how much confidence the ability to stop can give you! 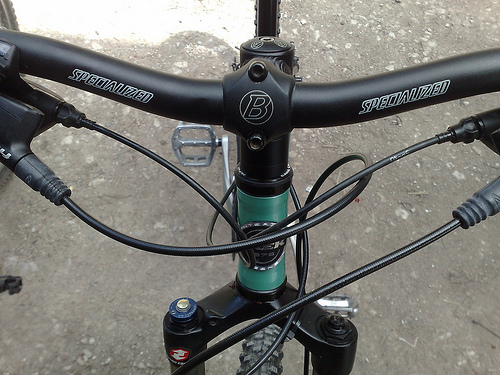 The slightly wider handlebars took some getting used to, but it generally made for a more stable ride. Forks were very smooth, but perhaps a bit too squodgy, so Mr. Toast is going to put a little more pressure in them. My first lap was very slow. I’m not sure whether this is because I was getting used to the new bike setup, or whether I was just fatigued from doing more exercise than usual (I’ve started going to the gym, did a session on Friday night, but I my legs and knees were killing me, and I felt that I couldn’t really push myself. I started doing a second lap, and I was much, much faster. Again, my flow was disturbed near the end of the track – this time by a huge mass of fly covered horseshit, right on the berm. Nice to know that people pay attention to the ‘mountain bike only trail/bikes only/no entry’ signs. Ho hum. I tried biking up the fireroad hill – failed again – and my knees were screaming at me. So I decided to do on last bit of FTD, before exploring. Found an awesome path which was literally like a rollercoaster, and it made me want to explore more. Maybe next week – got to lay off the risky stuff before the wedding! Highlights: The first three sections of the second lap, and having consistent braking! Bad bits: Inconsiderate bastards on the track. What, you can’t give the mountain bikers their one track, which they’ve built and maintained themselves. Good dogs seen: Meh, it was a bit barren for good dogs. There was something that looked like a staffie/jack russell cross – he was nice. Bit of a ropey day, this one. As Mr Toast and I were heading Oop North to his cousin’s wedding, we couldn’t get our normal amount of biking in. However, we couldn’t go a weekend without biking, so we went to the Chase and hired some bikes for a quick pootle around Follow the Dog. Being a bit of a shortarse, I couldn’t go on a full suspension, or even on a Trek 6 series, so I went around on a Trek 4 series. 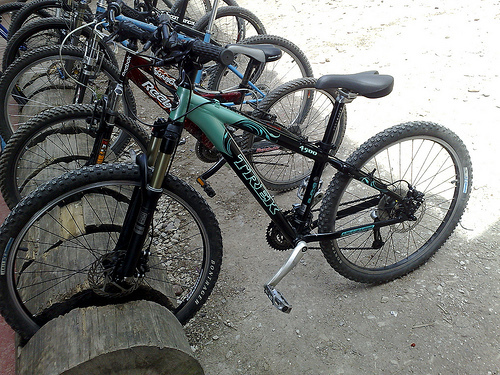 It suffered from the usual issues of me riding a bloke’s bike – the saddle was uncomfortable, and the forks practically imovable. 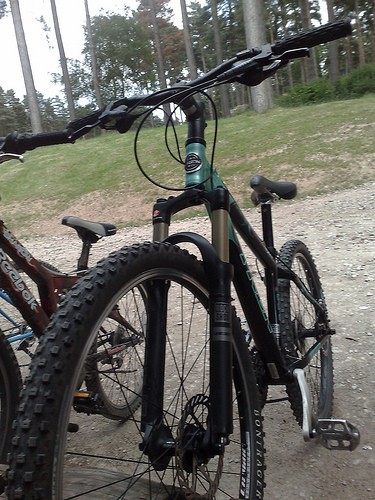 Yet it really wasn’t too bad, and I kind of liked the slightly wider bars. Mr Toast was a bit disgruntled with his bike, as it wasn’t particularly well set up for a perfectionist like himself.